OG Tradition, what are your gaming resolutions for 2015?? 2) Attend both MTG GP's in the UK this year - have as much fun as possible at both - I will not day 2... Winning some games would be nice!!! 3). Paint a Bolt Action army... Finally! 1) Finish off my Khorne Legion - just a few units then I'll be done (famous last words), but my pace is so slow now that taking all year seems likely. 2) Get to an X-Wing event or two, don't embarrass myself too much. Edit: Although, saying that, playing some more Dredd would be good at some point. I'm not sure what the state of that game is after Warlord took them over. 1. No one seems to want to play Dreadball, sigh, I think it's a great game and if I can persuade anyone to play I'm sure they'll agree! 2. Bretts/Blood Angels/Imperial Guard - all went on hold at various points in the year due to new books (alleged only in the case of the Bretts!). My planned mech-Angels are a no go, so I just need to think of a better list, still love me some Space Vampires. The Imperial Guard actually had a few runs out in 6th and a keen eye on Ebay has netted me loads of old metal Catachans so they should get a game or two of 7th, with some rather Traitor-Guard vehicles. 2. Lots of painting. I have Space Wolves (da*n you Stormclaw box set), Catachan Traitors, ghostly Bretts and Blood Angels in various states of stripping/converting/painting. I need to knuckle down and paint. 3. Get back into magic - I know I'm getting some Khans decks for me, the Mrs and her brother to play over xmas itself, so willl have legal cards for a year or so, win! 4. As usual, play more. Nonsense Tom - all you need is balsa wood. Behold! Disclaimer: Pip's screaming bell may or may not be a practical model for gaming purposes. Pip accepts no responsibility for injuries sustained while using a stupidly oversized screaming bell. Pip, that's genius. To Hobbycraft! Totally my mistake. After some hours in the Clan Moulder re-education camps, I now realise it's actually TRIPLE AWESOME..
- Finish my Imperial Knight (hope to get this pretty much done over Christmas, to pave the way in 2015 for.... lots of Blood Angels!!!). - Maybe try and get back to doing some more on the Chapter Fortress... though again this will be unlikely, knowing me. That should keep me going, and now that it's all written down I have something tangible to refer to this time next year to see how well I..... FAILED! I started a skaven army about a month ago, painting has picked up recently on them, and I'm quite enthused about them so hoping to get an army done first few months of this year. I bought some wind globadiers and jezzails and now it looks like the former at least might be released as a plastic kit for the next End times book if the rumourmill be true. 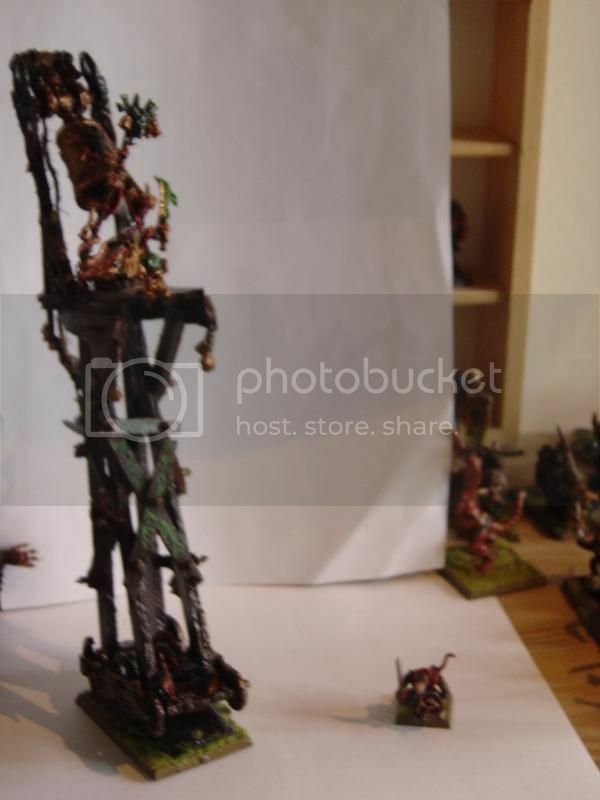 From the leaked image of the new Vermin Lord I think my Skaven army may actually have some further recruits to come in 2015 - Globadiers could be a nice looking addition, although I've never had any lucky with them in games (4+ to do 1 wound is pretty poor in a world of monstrous cav). If the alleged armoured rat ogres and a new Thanquol are also in the offing...sigh, it's going to be an expensive January! I have a Skaven army sitting on my shelf so I'm interested in these too!!! I'm going to start a painting blog for exploits on here... My 2014 effort was so dismal that I need some inspiration and encouragement!!!! When it's up... Please visit there and say nice things about me!!! - Survival of an entire dungeon in Warhammer Quest, preferably without needing ressurection.